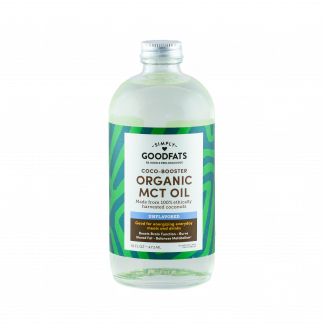 Simply GOODFATS delivers the best MCT oil. Medium-chain fats provide quick and powerful fuel that sparks energy all day. Experience keto-burn as your body works efficiently to fire-up metabolism and convert stored fat into fuel. This Organic MCT Oil doesn’t stop there. 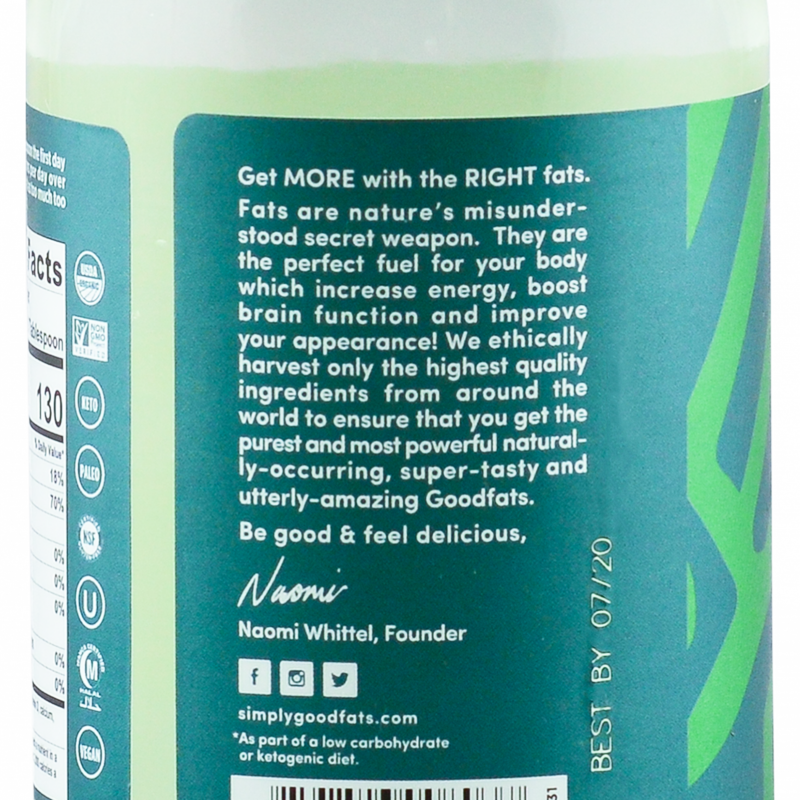 Our select type of good fat—derived exclusively from Simply GOODFATS coconuts—feeds cells, lifts brain fog, elevates mood and satisfies cravings. Make Simply GOODFATS Organic MCT Oil your daily superfood power boost. Pour, spoon or drizzle on everything you eat or drink. It’s all good. You know why processed foods are bad. Don’t settle for processed MCT oils that are chemically extracted from coconuts grown in poor soil and treated with extreme temperatures. We guarantee a better way. Simply GOODFATS starts with exclusive rights to the sweetest coconuts from a small community of growers. Unadulterated soil and perfect climate account for richness you can taste. We retain full flavor, potency and nutrition by cold-pressing our oil from the nutritious fruit. Then, we introduce the ‘Spark of Life’: Our patent-pending method worthy of its name. Natural enzymes are used to gently separate our MCTs from the coconut oil, and deliver purity and potency that’s greater than processed MCT oils. Our best MCT oil is made better through an 8-step testing process that delivers an MCT oil free from mold, mycotoxins, heavy metals and PHAs. A glass bottle keeps it pure. You’ll only find this standard of excellence here. Taste our commitment to purity, quality and freshness in every delicious drop of Simply GOODFATS Organic MCT Oil. Try it. Love it. Guaranteed. Mix, shake or drizzle onto food starting with one teaspoon on the first day and building to 3 tablespoons per day over several weeks. Store in a cool, dry place, away from light. No refrigeration necessary. These fancy-looking avocado cups make a colorful and filling snack, appetizer or light meal. Each cup contains more good fats, vitamins and minerals that can fit inside. For best flavor, use the freshest, best quality ahi tuna you can find. An iconic cookie flavor has been transformed into a gluten-free, protein and fat-packed treat that satisfies hunger, cravings and energizes your body with coconut MCTs. You’ll love the soft and chewy texture with just the right amount of sweetness. Sweet and savory unite in this lovely, crisp appetizer that delivers fiber, antioxidants and healthy fats. Use the freshest ingredients including unadulterated MCT oil (like ours) for best taste. It’s great for protein cycling and low-protein days. I feel like this actually really helps with my appetite. I take it with my coffee and I find that I am just not as hungry between breakfast and lunch. I also feel like I am getting some cognitive benefits out of this product, I feel more present and clear. I started out with a smaller dose, and now I can take 1 tablespoon per day. It has been a great addition to my routine, will continue! Convenience + Quality + Good taste = Works for me! For those who do Keto or Intermittent Fasting, this is a must have. My brain hits the ground running and I also feel like my appetite has decreased. I have been using this product for about 2 weeks and now have 2 tablespoons of this MCT oil between a couple of cups of coffee and then I am satisfied until lunch. I have already lost two pounds incorporating this product. I typically take a tablespoon right around breakfast time. 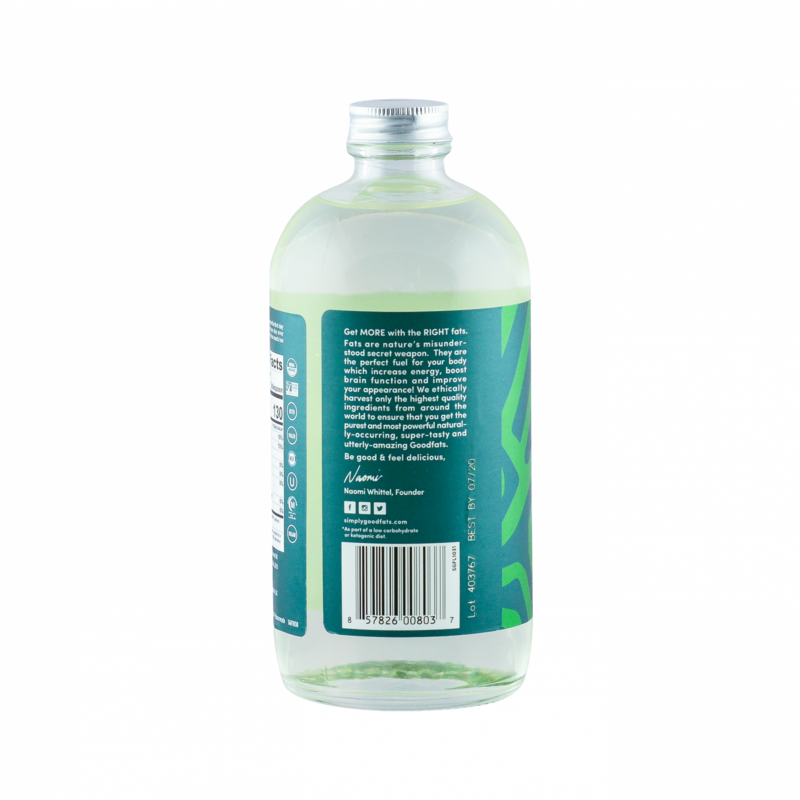 Although it is oil, it is completely odorless and tasteless, and super easy to take. I have noticed my energy levels have increased, I’m not feeling that afternoon slump and then search for caffeine that has been my daily routine for most of my adult life. I am definitely going to keep taking this product!